Formative assessment is important in every classroom. End of unit assessment should never be a surprise to students or their teacher. And with the availability of so many great educational technology tools, measuring student learning is easy to do. Check out five of my favorite ways to measure student learning in my classroom. Before my building implemented a 1:1 program, we allowed our students to bring their own devices for classroom use. It was around this time that I first stumbled upon Kahoot, and it has become a staple in my classroom. My students love competing against each other in Kahoot games, which we use a few times each week for formative assessment. Kahoot provides a variety of options for activities that engage students in the assessment process, making it fun. It offers both classic and team modes, which allow students to play a game as an individual or with a group. Students earn points by answering questions quickly and accurately, and enjoy watching the leaderboard throughout the game. Put Kahoot on your list of tools to try. I use it as a bell ringer, for test review, and more. Much like Kahoot, Quizizz allows teachers to gather evidence of student learning in a fun, gamified environment. When teachers create activities through the program, they can search for and use games and questions created by other users. This can be fantastic for students who are accustomed to answering questions only as their teacher creates them. Teachers have the ability to share an activity with students on Google Classroom to be completed in class or as homework. Questions and answers are displayed on students’ individual devices, which saves them from having to crane their necks to see the board around their peers. As students answer questions, they’re greeted with fantastic memes based on the accuracy of their response. So much fun. Teachers can view individual student progress and whole-class data, which is great for assessing student learning. Many students know Quizlet as a flash card creation tool, but it’s so much more than that. 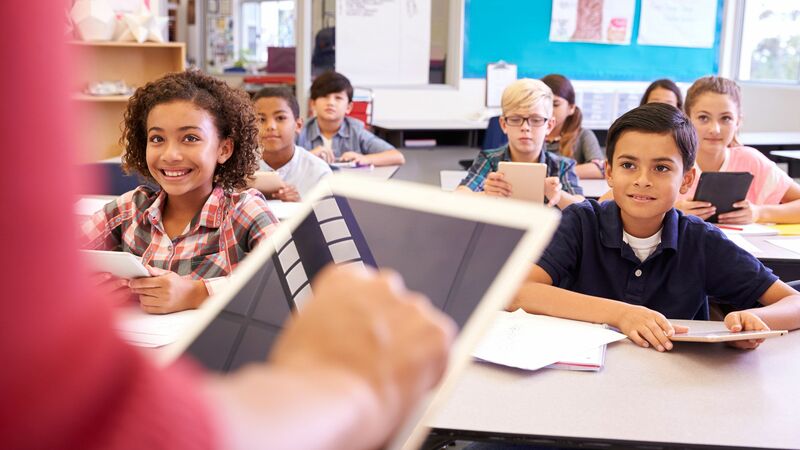 Recently, Quizlet unveiled Quizlet Live, which allows teachers to create collaborative learning games that emphasize concept mastery. Teachers can create a game from any Quizlet flash card deck. After at least six players join the game, they’re sorted into random teams. (Purchasing the premium version allows teachers to create their own teams.) Students must work together to correctly answer the questions. All team members see the same question on their screens, but they’re given different lists of answer options. As teams answer correctly, they move across the board. The team that answers 11 questions in a row correctly wins, and the competition aspect spurs kids to learn so they can support their team. If you’re looking for a collaborative space for your students to communicate about anything, look no further than Padlet, a free tool for teachers and students to share information, resources, images, and more (there’s also a premium version). I use Padlet in my flipped classroom as a backchannel to encourage all students to reflect on their learning. I create a Padlet wall for each of my classes called WSWR, which stands for “what should we review,” and I encourage each of my students to contribute a reflection from the instructional videos they watch. Students post concepts that they feel need to be revisited, and their classmates can reply to their posts. I also use each class’s WSWR wall to create a review screencast based on what the students feel needs to be reviewed. Over the past few months, Flipgrid has appeared as the new kid on the edtech scene. Through Flipgrid, teachers can create grids (similar to class sections in Classroom or a learning management system) and post topics for students to reflect upon. Using a quick, four-step process, students respond to prompts through a video. Teachers can view student responses and provide timely feedback, and can encourage students to reply to their classmates’ submissions. Teachers can share grids and topics via Google Classroom or a QR code, or keep the grid private.